Above: Albuquerque&apos;s Tumbleweed Snowman. Photograph by Brian Leddy. Since 1995, the Albuquerque Metropolitan Arroyo Flood Control Authority has been collecting gigantic specimens of tumbleweeds for its classic and beloved roadside installation, Tumbleweed Snowman, which appears on the Tuesday before Thanksgiving. From his perch at AMAFCA’s office, on the north side of I-40 between Carlisle and University Boulevards, he greets people until January. (Tip: He’s best viewed from westbound vehicles.) His more-or-less-symmetrical bod comprises three exceptionally large tumbleweeds held together with welded rebar. AMAFCA welder James Moya adds embellishments—buttons, arms, and a goofy grin—using recycled materials, including such detritus as an ax handle. His mother-in-law knits a new red scarf to wrap around his tumbleweed neck every year. The finishing touch? A blue AMAFCA cap, made from a 55-gallon drum. In all, the brambly icon can rise to 14 feet tall. Tumbleweed Snowman is now a tradition, as ephemeral as Frosty, here and then gone. Take I-40 west in the heart of Albuquerque. 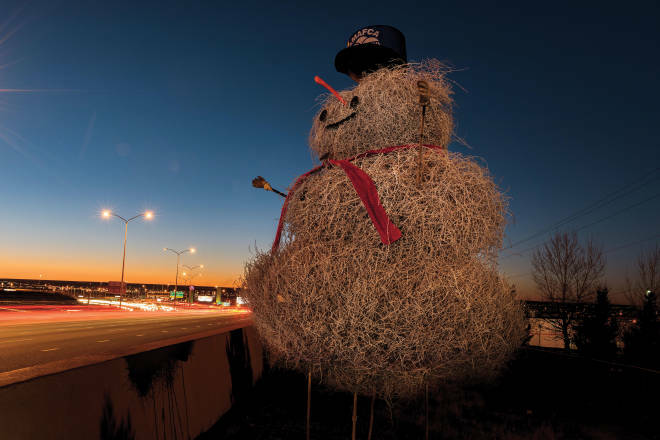 Between the Carlisle and University Boulevard exits, look north, and give Tumbleweed Snowman a wave.